Critical End! 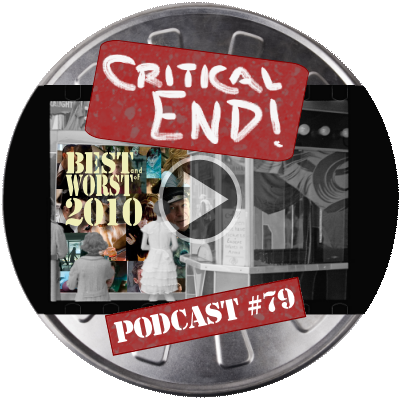 (The Podcast) #79: The Best and Worst of 2010 | Critical End! It’s our third annual best/worst show. Place your bets! REVIEWED: The highlights and lowlights of 2010. PLUS: Our first same-room recording since the beginning. This entry was posted on Monday, January 24th, 2011 at 6:00 amand is filed under . You can follow any responses to this entry through the RSS 2.0 feed. Both comments and pings are currently closed. “Mongolian Death Worm” was the best movie of the year, Sir!